A-LEC/OIT Learning Workshops Return for Fall! We are excited to announce this semester’s student workshops at the Altshuler Learning Enhancement Center (A-LEC)! Along with the A-LEC’s stellar lineup of learning strategy workshops, OIT also joins in with classes on Lynda.com, note-taking, and Excel. Here’s a quick rundown of the classes we will present this semester: Continue reading A-LEC/OIT Learning Workshops Return for Fall! At the end of February, we sent out a survey to all SMU staff regarding their interest in Excel training. This survey was created as all of our Spring sessions were filled to capacity the same day registration was announced! We also had a number of staff inquire about attending student-only sessions. However, those sessions were also heavily attended; therefore, we could not meet staff requests for attendance. 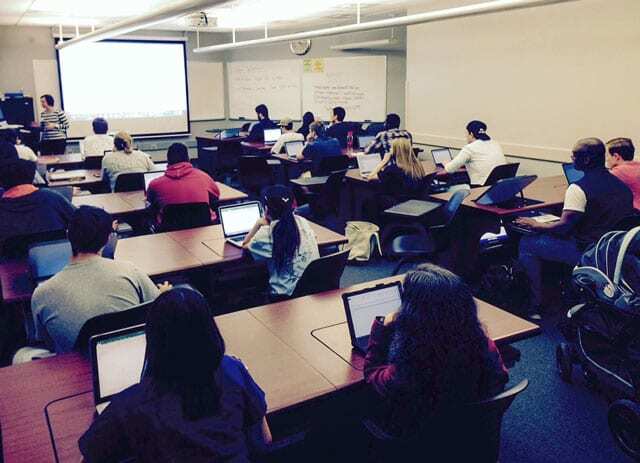 OIT and A-LEC Help Students Excel with Excel. Almost two dozen students attended last night’s Excel@Excel hands-on-workshop at SMU’s Altshuler Learning Enhancement Center. The OIT-lead workshop was part of the A-LEC’s practical learning strategy sessions offered throughout the term. A-LEC has partnered with OIT to facilitate four of the 25 sessions available to both undergraduate and graduate students. Yesterday’s workshop covered the basics of Excel and an introduction to formulas. OIT will offer a second Excel workshop for students on February 25th that will explore more in-depth formulas and functions. While last night’s and the February 25th session are both a student-only training, IT Training regularly offers workshops for all members of the campus community. For more information about upcoming training opportunities, visit our IT Training workshop schedule.